Deep South Containers specializes in roll off dumpster rental services for Lafayette LA, Lake Charles LA and all of Louisiana and east Texas. Call us for dumpster pricing. Roll off dumpsters are often used for commercial construction sites as well as for removing debris from home renovations, re-roofing jobs, yard waste cleanup and more. Whether you are a contractor or a homeowner clearing out the garage, roll off dumpsters are ideal for any project size. Deep South Containers offers 10, 15, 20, 30, and 40 yard roll off containers for all types of construction, demolition, permanent service, and spring cleaning projects. Dumpster price varies by size. When renting a container from Deep South Containers, you will never be surprised with any hidden fees in our dumpster pricing. Unlike many other waste removal companies, we do not add on fees for such things as fuel surcharges or environmental fees. The roll off dumpster price you are quoted for a rental is the fee you pay. 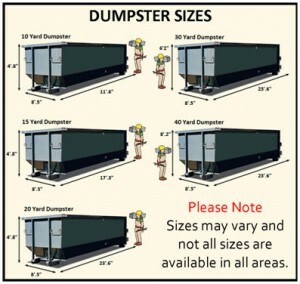 Stated dumpster sizes are estimated. Dumpster width and height may vary but capacity for each dumpster is consistent. Our 10 yard roll off dumpsters can hold 10 cubic yards of waste (approximately 3 full size pickup truck loads). They are perfect for yard debris cleaning, junk removal, or a small construction project. Our 15 yard roll off dumpsters can hold 15 cubic yards of waste (approximately 4 ½ full size pickup truck loads). Ideal for attic or garage cleanup, flooring or carpet removal, yard debris, and small kitchen or bathroom remodels. Our 20 yard roll off dumpsters can hold 20 cubic yards of waste (approximately 6 full size pickup truck loads). They are often used for medium sized home renovations and projects, demolition material, or construction debris. Our 30 yard roll off dumpsters can hold 30 cubic yards of waste (approximately 7 full size pickup truck loads). Perfect for small construction sites, home additions and renovations, major demolition projects, and new home construction. Our 40 yard roll off dumpsters can hold 40 cubic yards of waste (approximately 10 full size pickup truck loads. These construction dumpsters can handle your largest renovation projects, home additions, commercial construction sites, or large storm cleanup.